Heat oven to 375°F. Make drop cookies as directed on pouch. Cool completely, at least 30 minutes. In food processor, pulse 7 cooled cookies until crumbs form. (Store remaining cookies in airtight container for another use.) Transfer cookie crumbs to small bowl; mix with 1/4 cup of the frosting and 2 tablespoons of the decors. Use 1/4-teaspoon measure to shape little balls of cookie mixture. In medium microwavable bowl, microwave white vanilla baking chips uncovered on High 1 minute. Spoon remaining frosting over chips. Microwave uncovered on High 30 seconds; stir. If necessary, continue to microwave in 15-second increments until mixture can be stirred smooth. Pour fudge mixture into pan. Space cookie balls evenly on top, and press into fudge mixture. Spread fudge mixture evenly in pan to cover balls. Sprinkle remaining 2 tablespoons decors over top. Refrigerate uncovered until set, about 1 hour. Remove from pan by lifting foil; peel foil away. Cut into 8 rows by 8 rows. Store covered in refrigerator. 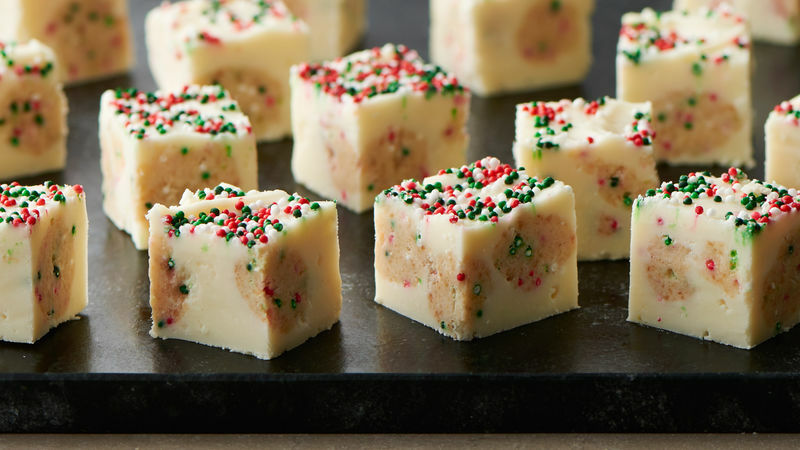 Smaller decors work best in the cookie balls, as larger ones make it harder for the cookie ball dough to hold together, but you can use whatever decors you like on top of the fudge. The fudge mixture will start to set up quickly, so make sure you have everything ready, and work quickly.